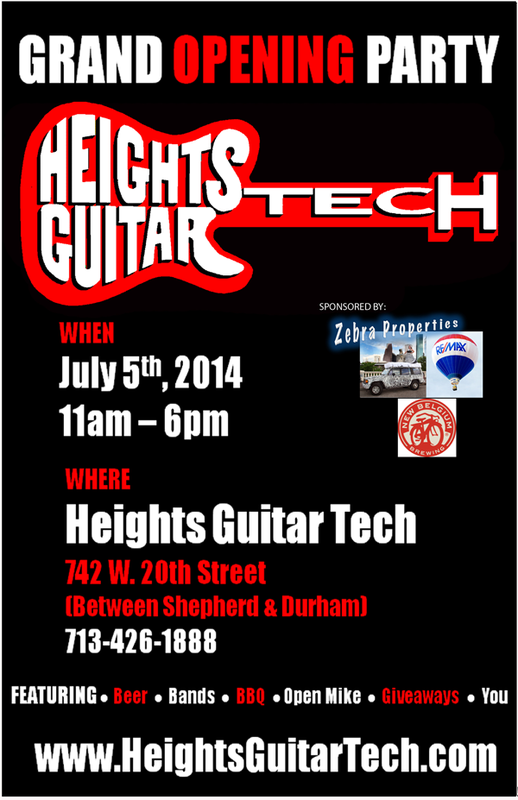 HOUSTON, TX (June 27, 2014) – Houston’s newest musical instrument and repair shop, Heights Guitar Tech is excited to announce their grand opening at 742 W. 20th Street (between Shepherd & Durham) to coincide with “First Saturdays in the Heights” monthly art market & music celebration on Saturday, July 5th from 11am – 6pm. Burman and Boriack enlisted Bob Hensley – a longtime musician, veteran of the industry, & expert luthier who specializes in setups and repairs of acoustic and electrical stringed instruments. Hensley will be available to repair your guitars, bass, banjos, mandolins, fiddles, cellos, violins, dulcimers and more. Jimmie Emerson, guitar tech for REO Speedwagon (currently on tour) will also be on board July 5th to perform guitar setups & repairs and and will join the team permanently full-time in the fall. 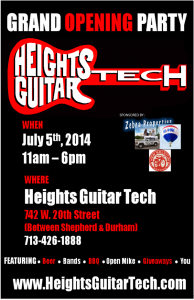 Heights Guitar Tech will also offer music lessons for those looking to learn or to improve their abilities and boasts the addition of Mark White, bass player for the 5 x platinum award-winning band The Spin Doctors as one of their celebrity musician instructors. The grand opening celebration on July 5th will feature live music performances by local and internationally known musicians, with an open mike for guests to join in or play a song or two, along with barbecue, beer, and giveaways featured every half hour 11am – 6pm on Saturday, July 5th. Mitch Burman is available for press and media interviews. To schedule an interview with Mitch Burman kindly contact Renee at your convenience by telephone at 832.364.0356 or via email: renee@charmingweb.com – You may also contact Mitch Burman directly on his cell phone 832.524.6184.